Pinduoduo’s target price raised by Analyst one week before IPO lock-up period ends, Morgan Stanley starts Pinduoduo Inc.(PDD) at overweight. Jan 17, 2019 /EqualOcean/ - By 22nd Jan, Pinduoduo's IPO lock-up period will come to an end, pre-IPO shareholders and company insiders will be able to sell their shares, change of share price of the popular Chinese e-commerce platform will be in the spotlight. Most analysts tracking Pinduoduo shares are quite optimistic these days, In fact, all seven of those covering the company recommend buying the security. Also, Morgan Stanley began covering the equity with an "overweight" designation, which suggests the stock is better value for money than others and set the target price at USD 29, this was raised by the Chief Analyst Grace Chen. From December 2018, Pinduoduo started to cooperate with reliable Chinese manufacturers, guide them to reduce cost while aid with a certain amount of quality control, these manufacturers, named Pin Gong Chang (拼工厂, literally means Pin Factories), on the other hand, benefit from the large customer volume the platform provides to expand their sales. Until 9th Jan 2019, more than 3000 manufacturers had sent out applications to become Pin Factories. As Chinese government promotes assistance to farmers, Pinduoduo is making huge efforts in expanding and further developing its projects of aiding farmers, the company selects two to three different types of agricultural produces every week, and deliver them to customers all over China. According to Tech.Caijing.com (财经网), in the past three years, Pinduoduo all together sold 5450,000,000 Kg of agricultural produces, annual growth rate exceeded 300%, becoming one of the most crucial channels for agricultural product sales. 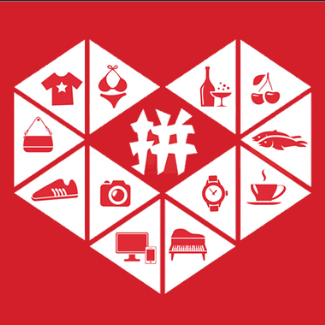 Many other E-commerce companies in China first launched their platforms in Tier 1 cities in the hope of gaining a large amount of customer volume; nonetheless, the customer volume of these cities will soon reach a point when no more can be found, then these E-commerce companies will turn their heads to other cities, where Pinduoduo had already dominated the market a long time ago.